Buy the digital $350 Community Screening License and you can show the film to as many people as you like - forever. 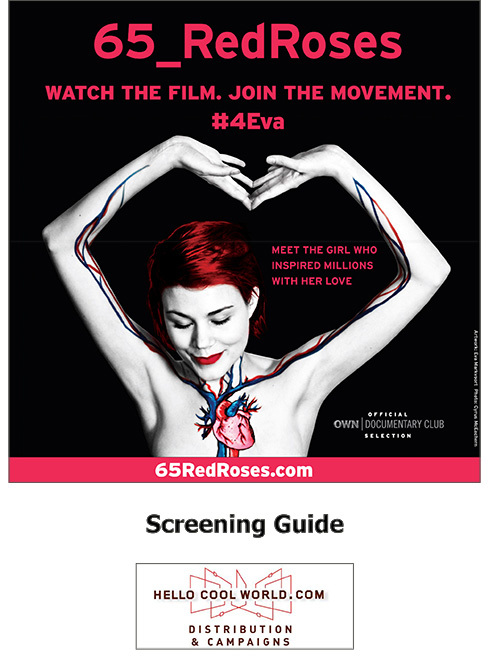 A screening of 65_RedRoses is about more than just bringing Eva’s moving story to your community—it’s a great way to raise awareness, encourage discussion, and generate action. A successful screening can be used as a fundraiser for your local cystic fibrosis group (or other cause close to your heart), and is an effective tool to drive organ donation. How can I re-coup the costs or use the screening as a fundraiser? Many screenings charge admission and find sponsorship to cover the venue and licensing costs. We also sell home DVDs (in Canada only) and campaign materials at reduced bulk rates to sell at your event to generate extra money. Contact us and we’ll be happy to put a package together that meets your requirements. I own a copy of the DVD. Can I use this for a screening? Unfortunately, no. You can use your DVD for private use, such as watching the film with a group of friends in your living room. But to show the film in a theatre or for a community event requires a public screening license. What’s involved in hosting a screening? Hosting a screening involves all aspects of organizing your event: finding and renting a venue, paying the screening license fee, and promoting it. We can offer support by helping to promote your event on our website, and through our Facebook and Twitter channels. We have a Screening Guide to help you host a successful event. Currently the film is available digitally or on DVD but we will investigate other formats if they’re requested. Contact us if you’re interested in the DVD or other formats. Where does the money from the screening license go? Hello Cool World is the Canadian distributor of 65_RedRoses with rights to sell community screenings in the USA as well. We are committed to investing all the proceeds back into a 65_RedRoses campaign for organ donation and cystic fibrosis awareness, #4Eva. I don’t have the time or resources to organize a screening, but I’d still like to help the campaign. We appreciate all kinds of support! Perhaps the greatest and easiest thing you can do in Eva’s memory is to become an organ donor. Encourage your friends and family to register too, #4Eva. Looking for a copy licensed for classroom and institutional use? Go to our Educational page. We’ve put together a comprehensive Screening Guide with tips and tools to make hosting a successful event as easy as possible. The guide includes checklists to help you set up and manage your event, as well as discussion suggestions and other resources.